Вчера я писал письмо 2 часа – Yesterday I was writing a letter for two hours. Я писал письма каждый день – I wrote letters every day. Я напишу письмо сегодня вечером -– I will write a letter tonight (but it really means that it will be finished by this night). Я приготовлю суп на ужин. – I will cook soup for dinner (it will be prepared by dinner time – I focus on the result). You can also meet the perfective aspect as infinitive when you are focusing on the result. Я хочу пойти в театр – I want to go to the theatre (I focus on the result). First when students start to learn Russian they learn only imperfective verbs. Later they learn that almost every verb has its perfective aspect. And they try to find a way to learn how to form perfective aspects. But the truth is that it is better to learn every new verb with its perfective verb separately. Because there are different variants of forming perfective verbs. 1. Many verbs make perfective aspect by adding the prefix -по. 2. Some verbs have different prefixes. 3. Some verbs change their suffixes. 4. Sometimes the perfective aspect is an absolutely different word. So everytime when you learn a new verb, look up the perfective aspect of it. 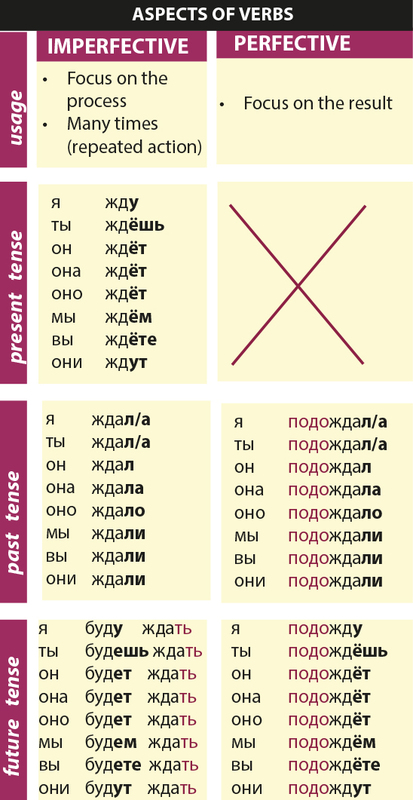 And the conjugation is really simple: past tense has the same endings with imperfective aspect (-л, -ла, -ло, ли) and future tense has the same conjugation as the present tense (-ю, -ешь, -ет, -ем, -ете, -ют).